Rory Stowaway has grown up in the protected Weedle Mouse community, but he knows ‘his own life [is] meant for adventure.’ Unlike the Weedle mice who scorn them, the Stowaways have ‘always been known as great explorers.’ But ever since Grampa Stowaway disappeared on a caper into the World Beyond, Papa has refused to take Rory and his twin brother, Morgan, exploring, as Terrible Things could happen. However, their Gran’s determined to search for Grampa, and Rory knows he must help her. With remarkable finesse and guts, they begin an incredible odyssey that carries them into a zoological museum and a scientific lab, where they are captured and barely escape through the mail. Meanwhile, Morgan initiates a search for his missing twin, and soon, the whole family’s involved, but not before a flood threatens their lives and home. Although the World Beyond proves as dangerous as Papa predicted, the diminutive but feisty Stowaways are up to the challenge. Black-and-white pencil illustrations capture the Stowaways in action. “Rory Stowaway is a young mouse yearning for adventure. He wants to explore the World Beyond like his ancestors but, ever since Grampa disappeared during one such expedition, his family feels differently. Papa believes his father was eaten by a cat and Gran insists that her travelling days are over. Rory is not so easily disuaded and soon enough the entire Stowaway family finds itself embroiled in a mouse-sized fantasy bigger than even Rory could have imagined. 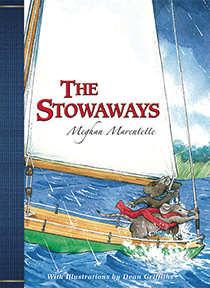 “I love everything about The Stowaways—from the beautiful Dean Griffiths painting on the cover to the bright red ribbon bookmark and the way that the book fits cozily in my hands. Even before opening it, I knew that it would take me back to a simpler time, and of classic children’s stories.